The art of leftovers is one of the most important skills in cooking for one. Leftovers are a double-edged chef's knife: normal recipes, unadjusted for a single appetite, can inflict days of identical meals, each bite growing less and less appetizing as the cook struggles to get through an entire deep dish lasagna, resisting the temptation to tip the rest of the blasted thing into the trash. After all, if she did, who would know? Just her guilty conscience, that's who. On the other hand, it is deeply satisfying to bundle up the leftovers of a delicious meal and pack them away for lunch. It's satisfying on the most basic level: you've cooked and provided for yourself with a minimum of waste and now you have something good to look forward to. Thus the art of leftovers: not too much, not too little - just enough of a meal that will be good reheated, without tricky, difficult bits that call for special equipment. Steak knives, for instance, or soup spoons. After many miscalculations and chucked out chicken breasts, I have gradually been learning to judge portions and create meals that will stretch for a day or two, but no more, and go into a box for a quick and still delicious lunch the next day. 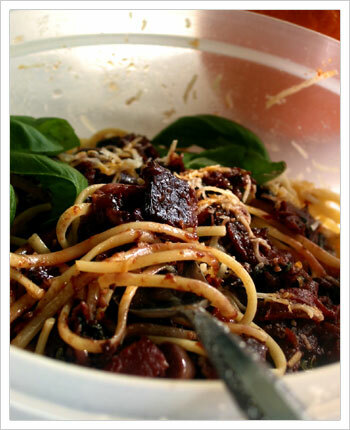 Pasta is my current favorite in the field of lunchtime leftovers. It's cheap, fast, easy, and it accommodates endless iterations of sauces, which use up other leftovers hanging about and often actually taste better after a night in the fridge. This particular meal is dead easy, a recipe that is really just a basic technique adaptable to any schedule or number of guests, following a sturdy formula of hot fat + spices + fresh ingredients + liquid, and limited only by your own ingenuity and creativity in ingredient juxtaposition. In this particular instantiation you sauté some bacon for a few minutes with red pepper flakes, add garlic and red onion, then chopped fresh tomatoes (or canned, if that's all you've got) and the cheap wine that's been turning to vinegar in the back of the fridge. I had quite a lot of Cabernet left over from another meal, so I just kept pouring it in and simmering it down. Go about your business and let it simmer as long as you need it to - or just ten minutes, if that's all you've got. Throw in some fresh basil near the end and serve over linguine or other pasta with heaps of fresh grated Parmesan (or the green bottle kind, if, again, that's all you've got). I'm almost embarrassed to call it a recipe; it's a classic, ridiculously simple dinner, and it certainly made my (next) day in its neat, friendly plastic bowl. The sauce is chunky, instead of runny, so no drippy tomato to stain my work clothes. Linguine is thick and easy to eat. 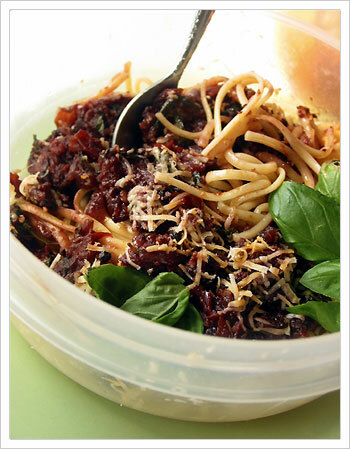 And the richness of flavor, with the savory notes of bacon, a little bite from the pepper, and the spicy fragrance of fresh basil heightened by long-simmered wine, all this was deepened after a night in the fridge and reheating. This is the best kind of leftovers: meals that are better twice than once. 1. Chop the bacon into small pieces and tip into a sauté pan over medium heat. 2. Cook the bacon slowly for about 8 minutes, until cooked through but not crispy. 3. Add red pepper flakes and toast in the bacon fat. 4. Add onion, chopped, and garlic, chopped, and cook until softened. 5. Add chopped tomatoes and red wine and simmer on low until sauce is thickened. 6. Five minutes before you want to eat, add the basil and stir until wilted. Add salt to taste. 7. Pour half the sauce over fresh-cooked pasta, cover with a thick blanket of fresh Parmesan, and enjoy. 9. Enjoy the other half the next day. oh, and i never got to eat strukli in croatia, we were in the wrong part, but our mantra for the trip fits this eventuality too "next time"
You are right the art of leftovers is one of the most important skill.Thank you so much for sharing wonderful recipe of Linguine with Bacon Basil Sauce here.I love cooking and I going to try this best recipe for my lunch.